Inskeep tells us that Obama's tour "is taking him to both sides of the dividing lines between Israelis and Palestinians. But while visiting both sides..."
Gonyea insists that Obama "is trying to balance things...probably the trickiest day of Senator Obama's overseas' trip." Too bad our intrepid NPR journalists don't report on some of that tricky balance. 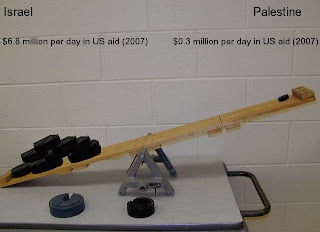 They could have started with that slightly imbalanced US aid to Israel (you can also click on the graphic above to see another breakdown of this aid). They also could have gone looking into the balanced killings and human rights abuses between Israel and Palestine. Or reminded us that one side is an internationally recognized state which has used the full force of its military and US alliance to occupy, annex and repress the other side for over forty years instead of treating the situation as if it were a conflict between two balanced forces. Inskeep: "What questions do Israelis have about Obama?" Gonyea: "They are worried that in dealing with the peace process with the Palestinians that in forcing compromise and trying to broker a deal, he might push the Israelis harder, he might side a bit too much with the Palestinians...and that's obviously reflected in the kind of things we're hearing from Jewish voters in America." Inskeep: "Are Palestinians any happier about Barack Obama?" Gonyea: "They have some concerns as well...will no doubt have a warm meeting with Mahmoud Abbas, but there is concern...he might bend over backwards to please Israel." I'm just curious how Gonyea knows what they are worried about? Who is this mythical they anyway? Gonyea is not reporting on surveys or polls. It's sloppy to report as if Israelis have some kind of unified opinion on Obama (or just about anything for that matter), and in spite of the reactionary politics of many American Jewish organizations - there are diverse opinions about US policy in Israel/Palestine (Jewish Voice for Peace or Tikkun for example). And of course, Gonyea is not talking about even a sampling of Palestinians, but only the US/Israel approved Palestinian officials who supposedly represent the "other side" in the conflict. You know, I never could stand Gonyea even when he was the Leprechaun from Motown, what with his 'ums' 'annnds', uhhs', etc., and his malfunctioning-gramophone speed-up/slow-down speaking style - (another NPR trainwreck, talent-wise; David Not-so-Welna is rapidly closing in on the Annoying Voice Award of the Week...) but I've found The Don's smiley, twinkly pronouncements (the 'THEY' references being the latest pungent examples) to be not only worthless, but - yes, if I may be so bold, dangerous. Yup, The Don is dangerous. Oh, and exasperating, too.